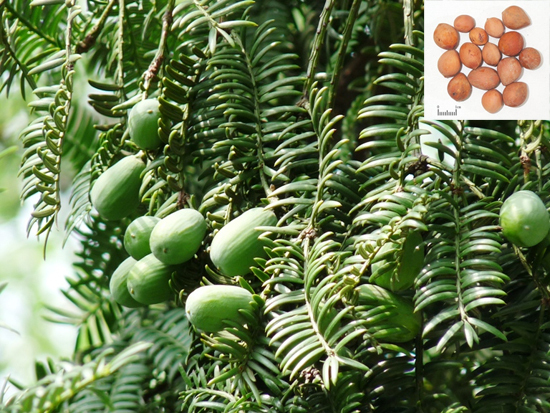 Botanical Name: Torreya grandis Fort. (Fam. Taxaceae). Part Used & Method for Pharmaceutical Preparations: The seeds are gathered in winter when the fruit is ripe and then dried in the sun. Meridians: Lung and large intestine. 1. Parasites in the intestines: a) hookworm Torrya seed (Feizi) is used with Basket fern (Guanzhong) and Areca seed (Binglang); b) tapeworm Torrya seed (Feizi) is used with Pumpkin seed (Nanguazi) and Areca seed (Binglang); c) roundworm Torrya seed (Feizi) is used with Chinaberry bark (Kulianpi), Quisqualis fruit (Shijunzi) and Black plum (Wumei). 2. For cough due to Dryness of the Lung. Dosage: 30-50 g. The parched kernel is chewed and swallowed, made into powder or pills, or mashed and used in a decoction. In treating ancylostomiasis, 30– 40 pieces are taken before meals every day until there are no worm eggs in the stool. Cautions & Contraindications: This herb can be taken with a decoction, but is most effective when made into a medical ball with honey and taken directly.